Schwartz & Wade, 9780385384919, 40pp. Lula Mae wants a puppy, but times are hard and she’ll just have to make do. 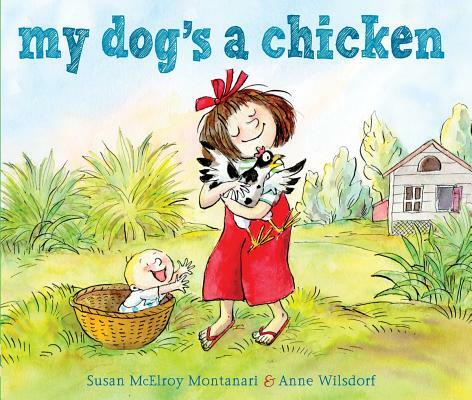 Her family has plenty of chickens, so she decides maybe a chicken can be a dog. Pookie, as Lula Mae names her, is an ordinary chicken, but Lula Mae thinks she is very doglike indeed. With a bow in Pookie’s hair, Lula Mae declares her a show dog. When she runs circles around the other chickens, Pookie is a shepherd dog. And when Cousin Tater sneaks up with a snake and Pookie starts bawk, bawk, bawking, well, she’s a guard dog, too. Then Lula Mae’s brother, Baby Berry, wanders away, and who do you think comes to the rescue? Readers will cheer for plucky Lula Mae and giggle over her beloved Pookie, who quite unknowingly saves the day. Susan McElroy Montanari has had many unusual pets over the years. She had a five-foot-long rat snake named Snookums, and her daughters once found a baby alligator in a neighbor's pool. She has spent much of her life on the beach and tidal creeks surrounding Savannah, Georgia. After several years in Norwalk, Connecticut, she has returned to live in Savannah with her husband and a cat named Tybee. This is her first book. Anne Wilsdorf’s cat, Istanbul, likes to watch her paint. Once, when Anne was drawing insects, Istanbul jumped on the paper, trying to catch the bugs as soon as they appeared under her pen. She is the illustrator of numerous books for children, including Sophie’s Squash by Pat Zietlow Miller, which received four starred reviews; Dogs on the Bed by Elizabeth Bluemle; The Best Story by Eileen Spinelli; and Alligator Sue by Sharon Arms Doucet. She lives and works in Lausanne, Switzerland.